It’s Halloween and everyone is dressing up to attend scary parties. Here at Ralhan Dental, we really believe the secret to winning the Best Costume prize at this year’s Halloween party is Monster Teeth, and whether or not they match the rest of your costume. If you want to win such a contest, with real judges, then you better try to be the scariest monster with matching and equally intense teeth. Even if the winner is ultimately decided using an applause meter app, having the correct teeth to match your monster type is often the deciding factor for many judges and clapping audience members. Option number one, the costumed character maker can easily seek and buy precast, one-size-fits-all plastic or rubber teeth which are easy to clip on, or mouth pressure fit, or even glued on with two-component dental friendly (nonwater soluble) adhesive. There’s a list of options and manufacturers besides each of the monster types listed below. The second approach is to make your own custom fit set of rubber falsies that can be worn comfortably over the top of your regular teeth. This can be done either by visiting a monster friendly dental clinic to get impressions in dental gel or buying a teeth impressions kit and doing it yourself. All the dentist or mold maker needs to do is make a cast of the upper and lower bite – it’s the positive around which you can get creative – you can add whatever you want on the exterior. Once you have the cast of your teeth you can play with rubber cement for months until you get the perfect set of teeth. As you become more skilled costume creator, you’ll evolve beyond the dentist because you’ll soon learn to take the impressions yourself and molds that are strong enough to make casts upon which rubber veneers can be painted and shaped. Here are the fangs and tusks kits from Monster Makers, below is an image of the Deluxe Dental Make-Up kit that sells for $175 US. The end result is to make a cast of your own teeth, or your subject’s teeth upon which you can make monster teeth using the materials provided in the kit. This could include fangs or tusks or even a zombie’s rotting teeth. If you’re an artist, the dental cast is your canvas. Do you want to become an ogre for Halloween? If so, I’m going to assume it’s because you’re a bigger person with a particularly meaty face, or perhaps it’s because you already have the leather smock and prosthetic ears? In either case, you need the distinctive tusks of an ogre. If you’re looking around for examples, you can forget Shrek; his chompers are cartoon character white and don’t really follow the general guidelines for his fictional species. Also disappointing was the ogre in Harry Potter which just looked like an elephant-sized mouse with square teeth and floppy ears – they probably used Shrek as the prototype. Finding good examples isn’t that hard; above is a ‘cosplayer’ orc spotted at Comic Con last year. This girl has a nice set of tusks (and look at those ram’s horns!). 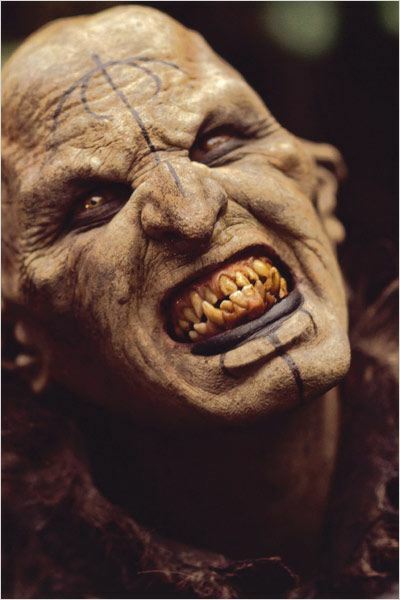 There are excellent examples of Ogres in Hollywood movies, like Ludo the lovable ogre from Labyrinth, and there are orcs by the thousands, literally, in Peter Jackson’s Lord of the Rings movies. Orcs and ogres evolved from the same general idea. Ogre’s teeth are signified by having pronounced lower incisors or tusks, as though the creature evolved from a smelly boar or something far worse. Troll tusks by Dental Distortions are a new generation of fake costume teeth. The Ogre monster in D&D could possibly derive from the biblical Og, the last of the giants. The modern word ogre is of French origin, originally derived from the name of the Etruscan god Orcus, who fed on human flesh. Its earliest attestation is in Chrétien de Troyes’ late 12th-century verse romance Perceval, li contes del graal. This word Ogre appears in Italian works of Fazio degli Uberti, 14th century; Luigi Pulci, 15th century; Ludovico Ariosto, 15th–16th centuries and has even older cognates with the Latin orcus and the Old English orcneas found in Beowulf lines 112–113, which inspired J.R.R. Tolkien’s Orc. One of the issues with tusks is the size and weight and proclivity to break away from the costume if any pressure is applied to the tip – they are like levers and the same force magnification principles apply in terms of their cantilever action. So the snap-on versions are particularly bad and the secret to comfort here is to make a form fitting rubber mold that embraces the entire lower denture – like a night guard, but with gums and white ivory tusks that are sure to win ribbons. Although the two monsters are entirely different, from a dental perspective they are similar because they both have ‘fangs’ that extend the canines incisors down from the top of the mouth. 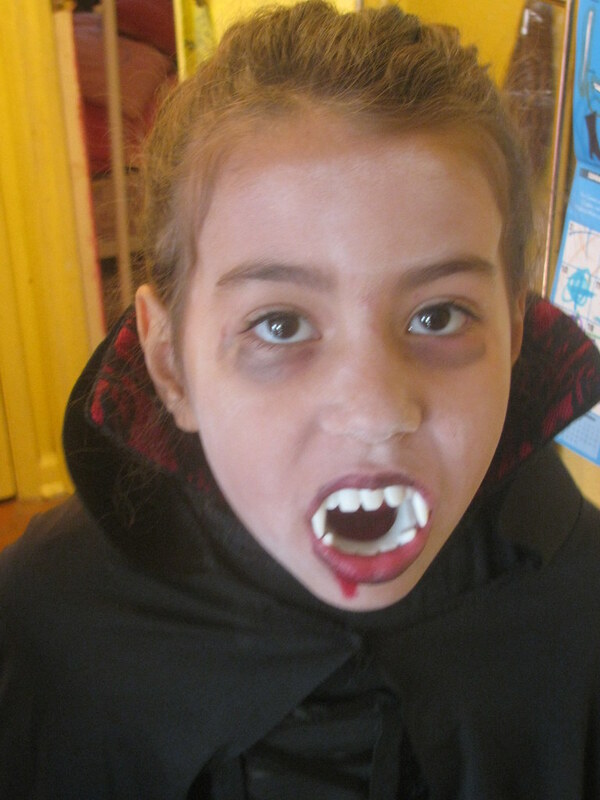 To the left is a preteen experiencing the worst in prefab vampire fangs with the Flickr user commenting, “Predictably, the plastic teeth were only used for the photo op.” on this very image she uploaded Halloween 2010. Also, the same engineering problems are present in this costume as with Ogre tusks; any force applied to the tip is compounded at the base and the fangs snap off. The solution is not more glue, but is once again is to consider making whole mouth molds with the fangs on the exterior of the bite. That way the costumed person can still close their mouth to swallow comfortably, but in every case, the act of eating a meal requires removing the apparatus. If you’re thinking about being a werewolf proper with a snout and lots of body hair, you might watch The Howling – which is top of many lists featuring classic werewolves. 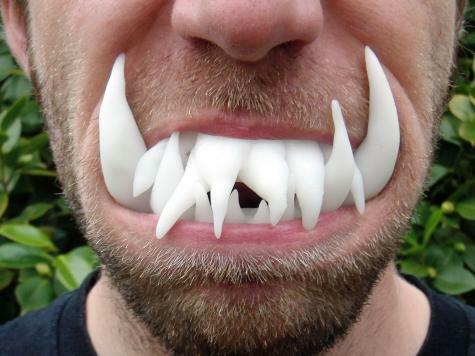 Werewolf teeth are generally yellow and dirty like a dog’s teeth, while Vampire teeth are insanely white and clean. Vampires are a great choice for female role playing initiates as this is arguably the sexiest monster at any party. Female vampire costume players in LARPS Live Action Role Playing games win great respect when they wear Viper Fangs – custom split vampire fangs which make the whole mouth more dangerous, and consequently more attractive to other wandering adventurers, and even other monsters. For men who like wearing beautiful old clothes, one of the best costumes on Halloween Night is the well dressed Vampire ala Anne Rice books. The man can adopt any gorgeous suit of clothes that speaks to 1800s Southern Fashion, esp the colourful garments of New Orleans, Louisiana. This costume is almost entirely made in the teeth. Zombies have come a long way since Night of the Living Dead, the iconic movie that accelerated the modern zombie story craze, and so have the cosmetic teeth available for costume characters. Perhaps the best examples of state of the art zombie ‘dental costumes’ are displayed on prime time TV shows with the very best being The Walking Dead. 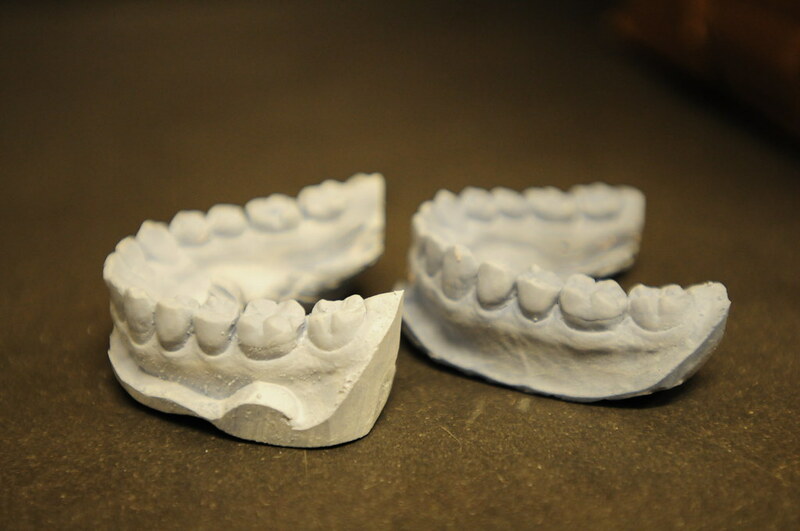 The best zombie teeth are thin rubber denture molds that are applied over the natural teeth. 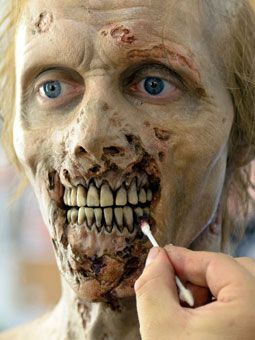 There are many Zombie Teeth molds for sale and there are dozens of fantastic YouTube videos on how to make wicked looking teeth by painting rotting teeth on your lips and cheeks. You can use ‘friendly plastic’ to make oversized teeth for more unusual monsters. While possibly on the fake-looking side, the goal to overwhelm and steal the show with a mouth full of pearly white knives. Don’t go too crazy though as teeth like these can be restrictive. They look great in the pictures, but they are typically never kept in the player’s mouth for any length of time – they may even annoy the gums and cause lasting damage if worn for a long duration. Players with oversized teeth are often not able to hold a conversation let alone consume anything without removing their mouth attire. Be sure and bring a container in which to store your monster teeth.